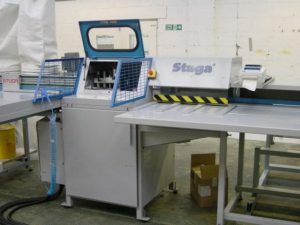 One Autocut is in stock to be refurbed and is available for sale (the Autocut can also be offered as a sill/ancil saw). This machine feeds from left to right. Why would anyone buy a double mitre saw when they can purchase a refurbished (or new) Stuga Autocut that is three times as fast, easier to use, more accurate and utilises real profile optimisation? This is a volume producing saw but also very popular with smaller fabricators as it takes the skill out of sawing as well as making the process fast and simple. These machines are also popular for ancillaries such as sills and add-ons for medium to large fabricators who want to automate this part of the process. Many bought and sold both new and refurbished. This is still a top selling product for Stuga. Note! Right to left feeding versions are few and so not likely to become available normally. These machines are now available for sale-call 01493 742348 today. Otherwise go to the contacts page and use the form. Either way we will be pleased to help. New Autocut saws are £70,000 plus vat and available in either hand. These machines will be fully refurbished in our workshop as normal but details will not be available until the work is complete. No machines are started yet and due to our currrent workload may not be started at least until until they are sold. The machines will be sold with a parts and labour warranty as normal. They are also now fitted with a new PC and full Microsoft Windows upgrade together with new CNC drives. Standard rebuild price is around half the new price. These rebuilds come with 12 months parts and labour warranty.